There are only three known groups of volant vertebrates. Two are extant: birds and bats. The third group is completely extinct and known only from fossils: pterosaurs. Often referred to colloquially as “pterodactyls”, pterosaurs are a diverse group of reptiles totally foreign to our modern minds, yet in some ways they are incredibly familiar, resembling the dragons of folklore. These prehistoric dragons came in all different sizes, from the tiny 25 cm wingspan of Nemicolopterus crypticus (although not fully grown, it is thought to have been a subadult (Wang et al, 2008)) to the enormous 10-11 m wingspan of azhdarchids like Quetzalcoatlus northropi (Witton et al, 2010), making these azhdarchids the largest known flying animals of all time. Size was not the only significant diversity factor among pterosaurs; rather, some had long necks and short tails, while others had short necks and long tails. Some had elaborate and bizarre cranial crests, some had toothless jaws, some had filter-feeding habits, and some had multicuspid teeth. The great variety of pterosaurs is astounding, and their fossils are known from all seven continents (Barrett et al, 2008), as well as Greenland (Jenkins et al, 2001) and New Zealand (Wiffen and Molnar, 1988). Pterosaur fossils are found in Mesozoic rocks from the Norian of the Upper Triassic to the Maastrichtian of the Upper Cretaceous (Butler et al., 2009; Unwin, 2006; Wellnhofer, 1991). This range is almost identical with that of dinosaurs, however, pterosaurs are not dinosaurs. Dinosaurs have a perforated acetabulum (hole in the hip where the femur articulates), among other features, which pterosaurs do not possess. Although we refer to pterosaurs as reptiles, they would not resemble any of our reptiles we find today. Certainly there are no flying reptiles around us (although there are gliding snakes and lizards), but pterosaurs also possessed a kind of integument consisting of hair-like structures termed pycnofibres (Kellner et al, 2009). These certainly would have been marvelous creatures to behold, majestically soaring far overhead or flapping along golden beaches in search of morsels washing in on crashing waves. Recognition of the uniqueness of the pterosaur design is inescapable. In fact, Kellner (1996) described 33 features shared by all pterosaurs that no other animal possessed. Even a cursory glance at a pterosaur skeleton will lead to the determination that there is really no other animal like it. Although there have been three vertebrate groups that possessed flight, all three had radically different constructions for their wings. 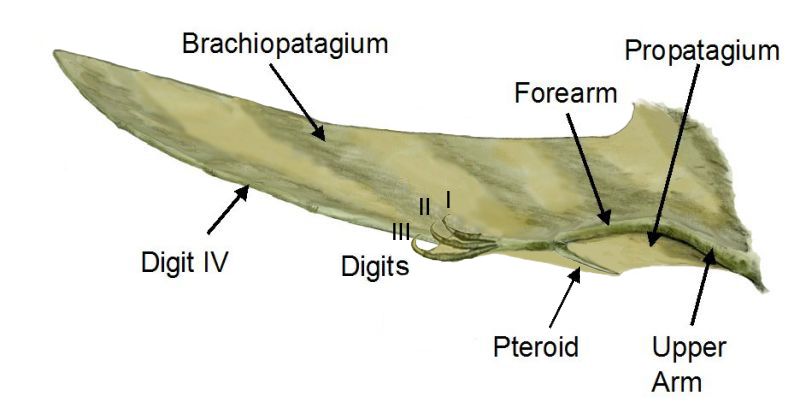 In pterosaurs, the wing is made up of a membrane that stretches from the body to the arm bones (Figure 1). Peculiar to pterosaurs, the fourth digit is greatly elongated, which allows the wing to stretch out much farther than the reach of the arm alone. Also peculiar to pterosaurs is a bone called the pteroid, which allows for a membrane (called the propatagium) to stretch from the wrist back to the shoulder anterior (in front of) the main portion of the wing. Based on fossil evidence, pterosaurs also seemed to have a portion of skin that stretched from the back legs to the tail called the uropatagium. The question that is raised in paleontological circles when such a unique group is discovered is, “Where did these creatures come from?” Conventional paleontologists, relying solely on naturalistic evolution, have intensely sought for the answer to this question, searching the Triassic pterosaur fossil record for answers. Despite the >200 years of searching, the picture has only become more complicated. Although the first pterosaur fossil was found in 1784, no Triassic specimens were known until the year 1973, when Rocco Zambelli described the pterosaur Eudimorphodon ranzii (Wellnhofer, 1991) from marine rocks in Italy. 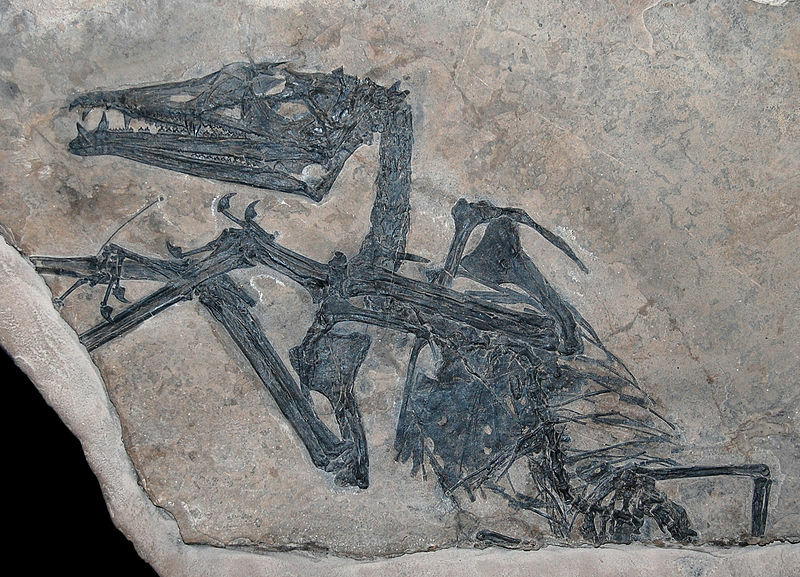 The holotype (type specimen) of E. ranzii (Figure 2) was well-preserved, but also very unique for pterosaurs. E. ranzii possessed multicuspid teeth, unlike later pterosaurs which often possessed unicuspid pointed teeth. Remember that in mammals, it is conventionally thought that multicuspid teeth evolved from simple pointed reptilian teeth. The body of Eudimorphodon was not particularly unusual for a “rhamphorhynchoid” (“primitive”, typically long-tailed forms), although later discoveries would show that some Triassic pterosaurs did not possess stiffening rods in their tails as the Jurassic long-tailed pterosaurs do (Dalla Vecchia, 2002). Eudimorphodon was certainly peculiar, but it did not appear to be the missing link that paleontologists were hoping for. In fact, many researchers consider Eudimorphodon to be a relative of Campylognathoides, which is thought to be one of the more advanced “rhamphorhynchoids”. Further discoveries in Italy turned up two other Triassic pterosaurs: Peteinosaurus and Preondactylus. Peteinosaurus is thought to be a member of Dimorphodontidae, whereas Preondactylus appears to defy assignment to a particular group. Unwin (2003) considered Preondactylus the most primitive pterosaur, whereas Kellner (2003) considered Anurognathidae to be the most primitive group of pterosaurs (despite the fact that anurognathids do not appear until the Middle Jurassic). Preondactylus does have some unique features, but once again, it has all the necessary features of a pterosaur. Further Triassic pterosaurs were discovered over the years. A new species of Eudimorphodon was found in Italy: E. rosenfeldi, which was later placed in a new genus (Carniadactylus rosenfeldi) (Dalla Vecchia, 2009a). Another species of Eudimorphodon (‘E.’ cromptonellus) was found in Triassic lacustrine deposits of Greenland (Jenkins et al, 2001); however, it is thought that ‘E.’ cromptonellus does not belong in the genus Eudimorphodon either (Dalla Vecchia, 2009a). Also discovered was Austriadactylus, a crested form from Austria (Dalla Vecchia et al, 2002) and later also found in Italy (Dalla Vecchia, 2009b). Switzerland has yielded two more Triassic pterosaurs: Raeticodactylus and Caviramus, although Dalla Vecchia (2009a) concluded that Caviramus is actually Raeticodactylus. There are several specimens from the Alps that most likely represent new species (Dalla Vecchia, 2009a), such as BSP 1994 I 51, which was originally described as a specimen of E. ranzii (Wellnhofer, 2003). A recently discovered form from Brazil, Faxinalipterus, was hailed as the most primitive pterosaur known (Bonaparate et al, 2010), but Dalla Vecchia (2013) concluded that the remains are most likely not even pterosaurian. A recently discovered jaw from the Chinle Formation of Petrified National Forest, Arizona, U.S.A. is thought to be from a pterosaur (Whatley et al, 2013). There are several discoveries of multicuspid teeth attributed to pterosaurs from the Norian and Rhaetian of Europe and North America, but Dalla Vecchia (2013) noted that unrelated and contemporaneous synapsid chiniquodonts and “dromatheriids” have very similar teeth, so this casts doubt on the pterosaurian nature of these teeth. One thing is apparent from this list: at the initial onset of pterosaurs in the fossil record, there are already several species, and they span across a good portion of the globe (especially when including a currently undescribed specimen from Argentina). There are at least 4 families of pterosaurs represented in the Triassic: “Preondactylidae”, Campylognathoididae, Dimorphodontidae, and Raeticodactylidae (Andres et al, 2014). Thus, the earliest appearance of pterosaurs is anything but simple. In fact, the diversity is even more complex as Dalla Vecchia (2009a) determined that ‘E.’ cromptonellus and specimen BSP 1994 I 51 appear to be outside of Campylognathoididae (although he found the raeticodactylids to be within Campylognathoididae). Interestingly, this is a similar situation to other groups in the fossil record. “Pelycosaurs”, therapsids, dinosaurs, and many other groups all show up in the fossil record with great diversity already in place. This also matches the pattern seen in the Cambrian Explosion, albeit on a much smaller scale. Despite the great diversity, Triassic pterosaur specimens are incredibly rare. The number of known fossil specimens of definite Triassic pterosaurs is 32 or less (McLain et al, 2014). This differs greatly from much of the rest of the pterosaur fossil record where individual pterosaur species can be known from 30 or even over 1000 specimens (Kellner, 2010). Almost all of the known unquestionable pterosaur specimens are from marine deposits, the only exclusions being ‘E.’ cromptonellus from a presumed lacustrine deposit, and the newly found jaw from the terrestrial Chinle Formation. In fact, Dalla Vecchia (2013) noted that all unequivocal Norian pterosaur specimens are from the tropical margins of the Pangean gulf of Tethys. The general lack of pterosaurs in Triassic terrestrial deposits is puzzling, especially since there are Triassic sites with exquisite preservation of vertebrates such as Ghost Ranch, New Mexico, U.S.A. and the Karoo Basin of South Africa. This is also puzzling as pterosaurs presumably evolved from terrestrial ancestors. The complete lack of any “proto-pterosaurs” in the Triassic terrestrial deposits is problematic for naturalistic evolutionary theory. A possible solution suggested by Dalla Vecchia (2013) is that the “proto-pterosaurs” were non-volant and were living far away from sites where excellent preservation would occur. A similar suggestion has been made for the lack of ancestral forms to hard-bodied Cambrian taxa. Although preservational bias does appear to have a noticeable effect among pterosaurs (Butler et al, 2013), it seems like it would be easier to fossilize the non-flying ancestors of pterosaurs, with their less fragile bones, than their flying descendants. Interestingly, there are no known Triassic pterosaur footprints. In fact, the pterosaur footprint record starts in the Upper Jurassic, although there may be a few examples of Middle Jurassic pterosaur tracks (Lockley et al, 2008). The sudden appearance of pterosaur tracks in the Upper Jurassic – Lower Cretaceous coincides well with the explosion of pterosaur taxic diversity and paleoenvironmental diversity in the same interval (McLain, 2012). Might the Flood provide a better explanation for the pterosaur fossil record? It is possible. Since pterosaurs are so incredibly distinct (i.e., they are discontinuous from all other organisms), it seems unlikely that they evolved from terrestrial reptiles. Thus, creationists would not expect to find any “proto-pterosaur” fossils. Additionally, pterosaurs might be buried based on habitat preference or flight ability rather than evolutionary stage. This might explain why more “advanced rhamphorhynchoids” such as Eudimorphodon would be buried alongside more “primitive rhamphorhynchoids” such as Peteinosaurus and Preondactylus. Rather than finding a trunk to the pterosaur tree at the bottom of the pterosaur fossil record, which the naturalistic evolutionist paleontologist might expect to see, the evidence suggests the lowest pterosaurs in the fossil record are already very diverse in the number of species, as well as the number of families. Even just a quick glimpse at a small subset of pterosaurs provides a fascinating view at a bizarre and beautiful world that we are only beginning to grasp. Triassic pterosaurs seem to defy the expectations of many researchers just as the initial discovery of the first pterosaur specimen in 1784 did for those who had never even imagined such a creature. Pterosaurs – Triassic, Jurassic, and Cretaceous forms – present for us an excellent lesson in science: when what we expect to see does not match reality, it is necessary for us to go back and challenge the things we thought we knew, for in them there is much assumption, and not all assumption is well-placed. Andres, B., Clark, J., and Xu, X., 2014, The earliest pterodactyloid and the origin of the group: Current Biology, doi:10.1016/j.cub.2014.03.030. Barrett, P.M., Butler, R.J., Edwards, N.P., and Milner, A.R., 2008, Pterosaur distribution in time and space: an atlas: Zitteliana, v. B28, p. 61–107. Bonaparte, J.F., Schultz, C.L., and Soares, M.B., 2010, Pterosauria from the Late Triassic of Southern Brazil, in Bandyopadhyay, S. ed., New Aspects of Mesozoic Biodiversity Lecture Notes in Earth Sciences, v. 132, p. 63-71. Butler, R.J., Barrett, P.M., Nowbath, S., and Upchurch, P., 2009, Estimating the effects of sampling biases on pterosaur diversity patterns: implications for hypotheses of bird/pterosaur competitive replacement: Paleobiology, v. 35, no. 3, p. 432–446. Butler, R.J., Benson, R.B.J., and Barrett, P.M., 2013, Pterosaur diversity: untangling the influence of sampling biases, Lagerstätten, and genuine biodiversity signals: Palaeogeography, Palaeoclimatology, Palaeoecology, v. 372, p. 78–87. Dalla Vecchia, F.M., 2002, A caudal segment of a Late Triassic pterosaur (Diapsida, Pterosauria) from North-eastern Italy: Gortania, v. 23, p. 31-58. Dalla Vecchia, F.M., 2009a, Anatomy and systematics of the pterosaur Carniadactylus gen. n. rosenfeldi (Dalla Vecchia, 1995), Rivista Italiana di Paleontologia e Stratigrafia, v. 115, no. 2, p. 159-186. Dalla Vecchia, F.M., 2009b, The first Italian specimen of Austriadactylus cristatus (Diapsida, Pterosauria) from the Norian (Upper Triassic) of the Carnic Prealps, Rivista Italiana di Paleontologia e Stratigrafia, v. 115, n. 3, p. 291-304. Dalla Vecchia, F.M., 2013., Triassic pterosaurs, in Nesbitt, S.J., Desojo, J.B., and Irmis, R.B. eds., Anatomy, Phylogeny, and Palaeobiology of Early Archosaurs and their Kin, 379, Geological Society of London, Special Publications, p. 119-155. Dalla Vecchia, F.M., Wild, R., Hopf, H., and Reitner, J., 2002, A crested rhamphorhynchoid pterosaur from the Late Triassic of Austria: Journal of Vertebrate Paleontology, v. 22, n. 1, p. 196-199. Jenkins, F.A., Jr., Shubin, N.H., Gatesy, S.M., and Padian, K., 2001, A diminutive pterosaur (Pterosauria: Eudimorphodontidae) from the Greenlandic Triassic: Bulletin of the Museum of Comparative Zoology, v. 156, no. 1, p. 151–170. Kellner, A.W.A., 1996, Description of new material of Tapejaridae and Anhangueridae (Pterosauria, Pterodactyloidea) and discussion of pterosaur phylogeny, PhD thesis, Columbia University, [Published by University Microfilms International/ProQuest]. Kellner, A.W.A., 2003, Pterosaur phylogeny and comments on the evolutionary history of the group, in Buffetaut, E. and Mazin, J.-M. eds., Evolution and Palaeobiology of Pterosaurs, 217, Geological Society of London, Special Publications, p. 105–137. Kellner, A.W.A., 2010, Comments on the Pteranodontidae (Pterosauria, Pterodactyloidea) with the description of two new species: Anais da Academia Brasileira de Ciências, v. 82, no. 4, p. 1063–1084. Lockley, M., Harris, J.D., and Mitchell, L., 2008, A global overview of pterosaur ichnology: tracksite distribution in space and time: Zitteliana, v. B28, p. 185–198. McLain, M. A., 2012, Pterosaur diversity parallels changes in paleoenvironment, Geological Society of America Abstracts with Programs, v. 44, no. 7, p. 401. McLain, M.A., Chase, B., and Bryant, E., 2014, PteroTerra: a searchable pterosaur database web application that interfaces with Google Earth: Historical Biology, doi: 10.1080/08912963.2014.929671. Unwin, D.M., 2003, On the phylogeny and evolutionary history of pterosaurs, in Buffetaut, E. and Mazin, J.-M. eds., Evolution and Palaeobiology of Pterosaurs, 217, Geological Society of London, Special Publications, p. 139-190. Unwin, D.M., 2006, The Pterosaurs from Deep Time: Pi Press, New York, New York. Wellnhofer, P., 1991, The Illustrated Encyclopedia of Pterosaurs: Salamander Books Ltd, London, United Kingdom. Wellnhofer, P., 2003, A Late Triassic pterosaur from the Northern Calcareous Alps (Tyrol, Austria), in Buffetaut, E. and Mazin, J.-M. eds., Evolution and Palaeobiology of Pterosaurs, 217, Geological Society of London, Special Publications, p. 5-22. Whatley, R.L., Behrensmeyer, A.K., McIntire, S.B., Ramezani, J., and Parker, W.G., 2013, First pterosaur dentary and postcrania from the Upper Triassic Owl Rock Member, Chinle Formation, Petrified Forest National Park, Arizona: Journal of Vertebrate Paleontology Annual Conference Program and Abstracts,, p. 237. Wiffen, J., and Molnar, R.E., 1988, First pterosaur from New Zealand: Alcheringa, v. 12, p. 53–59.